Maago, MIDI Control Surface for DJ from Maago. 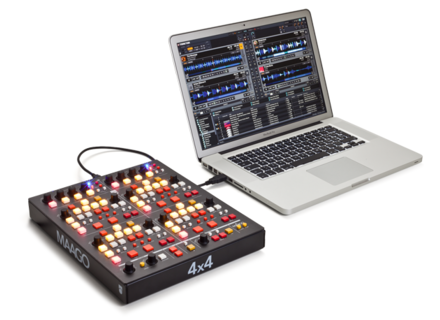 The Maago 4x4 is a four decks usb/midi DJ controller designed to work with Traktor Pro. It comes with 20 knobs and 40 buttons in an aluminum case and can control Traktor Pro versions and DJ software that supports the MIDI protocol. Connect the Maago 4×4 unit to a computer running Traktor (or other DJ software) and you'll control your 4 decks, 4 effect parameters, loop controls, etc, simultaneously and with no need to use the shift button to reach all these functions. Rotary knobs and 40 backlit buttons provide visual and tactile feedback, letting you perform on Traktor without having to touch your computer. All buttons and knobs have been mapped in a .tsi file that you import into your Traktor mapping preferences. Maago advises to use the pre-mapped .tsi file for Traktor use but it can be re-mapped. 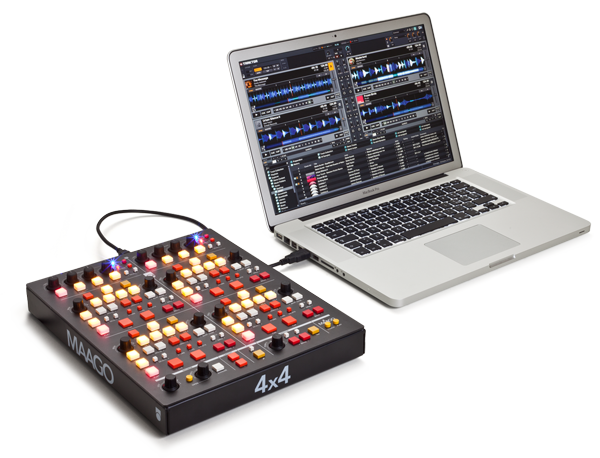 Maago 4×4 can also be used as a standard MIDI controller for other software supporting the MIDI protocol. Each of the 4 decks has its own dedicated area and includes the main functions that Traktor supplies. There is room for control of selecting, cueing, synching and pitching tracks, so you don’t have to worry about multi-function buttons. 20 knobs and 40 buttons simultaneously control up to 4 effects on each deck, loop controls, cue points, seeking, scratching, browsing, etc. As the unit is expected not to ship untill end of this year, we don't have a price yet. Check out Maago for more details. Native Instruments Releases Traktor Pro 2.5 Native Instruments announced the availability of Traktor Pro 2.5. Gemini CDJ 700 Review Today, every DJ gear manufacturer wants a piece of the control surface market. That's why Gemini decided to introduce now a versatile, fully featured CD deck. The CDJ 700 is a very appealing product with a look that recalls the Pioneer CDJ 900 — plus it has almost the same features and a much lower price. Let's check out if the newcomer can compete with Pioneer's leading products. Reloop Terminal Mix 4 Reloop announces its digital mixing controller designed especially for Serato: Terminal Mix 4.